BTW, I just found another article entitled The Evolution of Computer RPGs by Jay Barnson. If you liked my article, be sure to check this one out as well! 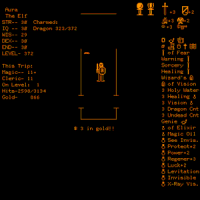 Does anyone remember what happened when you beat Mondain in Ultima I? Thank you for writing a thought-provoking, informative, and nostalgia-tripping article! I've got a few comments and arguments (for the sake of discussion), if you don't mind. 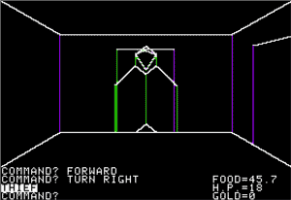 If I recall correctly, my very first computer gaming experience was with a game called "Dungeons and Dragons" on the TRS-80 (Model 1 Level II), circa 1979-80. It was pretty much a straight text adventure, but it added the D&D conventions of character class, attributes (strength, dexterity, contritution, etc. ), and even random encounters. 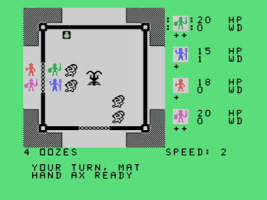 Believe it or not, this system came closer to an authentic D&D experience than any other D&D-inspired game I've ever played since. I don't know what most people's D&D experiences were, but in mine, you were definitely accused of "bieng immature or schizo" by the non-D&D-initiated! I remember when a popular girl saw me reading a D&D "Monster Manual" on the schoolbus, and she said to me "you live in a fantasy world!" I was really embarrased.. :-) That's just one of many anecdotes. By the way, I played D&D heavily in high school, primarily as a "Dungeon Master," and had the best D&D campaign going, according to my players/friends. Sadly, when enough "concerned" citizens realized that so many young people were having so much fun playing this new game, they began insinuating and then outright accusing players of engaging in a "Satanic ritual" or, at the very least, dangerously influenced by hidden subliminal content (.........) The fact that so many people are still willing to buy into this rubbish is far more fearful than any demonic foe encountered in a D&D session! Ironically enough, many of the friends I played D&D with were far more devout Christians than anyone else I knew. Even the ones who weren't religious tended to live more morally upright and ethical lives than most other folks--another reason, no doubt, for religious hypocrites to despise them. Alright, here's were I delve into controversy. In my experience, I saw several things that might bear out the cause for concern amongst parents, Christian or otherwise, in pen-paper-dice D&D (not the computer RPG's, which I consider harmless). No, I never saw a satanic ritual performed, and my D&D-playing friends and I came through the D&D experience unscathed (as far as I can tell), but I have no doubt that playing D&D can alter the viewpoints (religious, moral, etc.) or behavior of CERTAIN INDIVIDUALS (not everyone). I noticed this even as a D&D-playing teenager, and could flood this article with anecdotes on the subject. Playing "real" D&D can be quite immersive, especially when one considers the time players spend "in character." A typical D&D campaign is played regularly in several-hour sessions, and such campaigns can go on for months, weeks, or even years! Can playing a powerful, respected fantasy character in a role-playing game for such a length of time and immersion really not have the potential to cross over into one's "real" personality? I think it's possiblle that playing lots of D&D, just like watching lots of TV or listening to political talk radio for 15-hours a week, can significantly alter one's personality or moral/religious viewpoint. Ironically, this is why I don't think computer games, RPG or otherwise, are as "dangerous" as these other pasttimes. The immersion/thought-provoking factor is just not there in computer games (in general). I never believe I am Mario, Galen the Sorcerer, or Rambo in a computer game. I'm simply interacting with a finite game interface and not actually becoming someone else. Hey, great article. Interestingly, I was just listening to back shows of RetroGamingRadio and just tonight happened to hear a letter from a Matt Barton about CRPGs!! Great article, looking forward to parts two and three whenever they make it here. I recently acquired an extensive collection of TI-99/4a Plato discs along with the requisite cartridge interpreter. I have a feeling that micro Plato (I think the Atari 800 and Apple II were also supported) only featured the educational titles, but I'd love to discover some of the Plato games as well if they were indeed compatible. Hopefully I'll get a chance to check it out soon. PLATO has always fascinated me. I never had first-hand experience with it in its prime, unfortunately, but I slowly learned about it when I got into heavy-duty collecting. 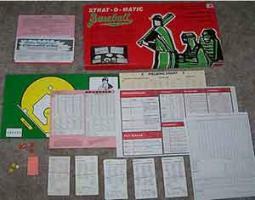 Interestingly, after long being a mainframe platform and having countless hundreds of educational (and a few game) modules written for it, it was decided by Control Data to have PLATO appear in the burgeoning home market in the early 80's. As fate would have it, the company chose the TI-99/4a as their marquee platform. Unfortunately, there were some delays and by the time the micro version of PLATO was released on the TI-99/4a, that platform dying, with Texas Instruments obviously soon pulling out entirely. For PLATO to work on the TI, you needed the interpreter cartridge and then the individual modules came on disk format (something the TI didn't have a particularly high user base for). After TI pulled out, Control Data bought up some of the remaining TI inventory of the late model beige TI-99/4a's and put a Control Data nameplate over it and made a small change to the boot-up BIOS. They sold these systems to educational facilities for a short time. As it stands now, the PLATO interpreter cartridge is fairly valuable as such things go, with a loose cartridge commanding $35 - $50 on the open market. Individual PLATO lesson modules are rarer still, though I don't have enough data to judge their worth. I got lucky and got a PLATO interpreter with a large bundle of module disks for about $85 - $90 if I remember correctly. A branded Control Data TI-99/4a commands a fairly pretty penny loose, around $80 itself, which is quite a bit more than a TI branded model. Obviously the micro version of PLATO was released for other platforms concurrent to the TI. I believe there were Apple II, Atari 8-bit and IBM PC versions (I could be wrong on the latter). Since the original mainframe version featured such a high resolution, I believe each of the micro versions had to make certain concessions, be they scrolling or color depth (for instance there's a hi-res monochrome mode in Atari 8-bits that I believe was an option). The educational value of the mainframe and micro versions (I believe the micro versions of the interpreter pretty much took the same module code) is immense and it's a fascinating subject all the way around. It was definitely underappreciated by those who didn't have full use of the mainframe versions (I don't think any of the micro versions caught on much). Part of the problem with the micro versions was problem the high cost of entry. In any case, this is all from memory. I absolutely plan on revisiting PLATO in the future on AA and will be aggressively targeting my own micro PLATO collection for the TI as the basis (and fingers crossed that some of the games are on there). This is the kind of thing that really should be made known to as many people as possible and one good way to do that is through a really interesting feature article. Yes, I talk about the game in Part Two ("The Golden Age.") It's noted for its heavy reliance on J.R.R. Tolkien. 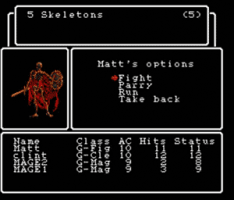 Many fans of "Roguelike" games consider it to the best of the lot. 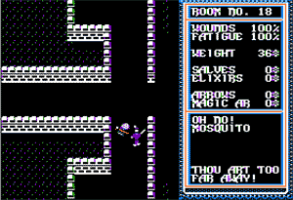 I must say, though, that the C-64 version looks terrible (at least the one I was able to find). The DOS version looks much better.